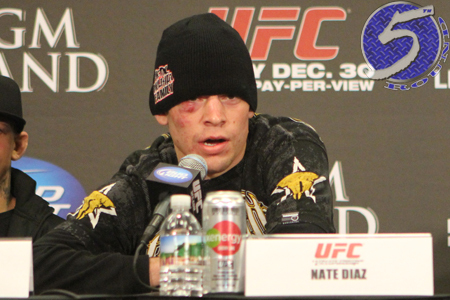 The good news for Nate Diaz (pictured), he’s still employed by the Ultimate Fighting Championship. The bad news for the lightweight, his bank account is $20,000 lighter and he was issued a 90-day suspension for the homophobic tweet he sent Thursday. Just two days after Pat Healy revealed he tested positive for marijuana following last month’s submission victory over Jim Miller, which cost “Bam Bam” $130,000 in Fight Night bonuses, Diaz, one of the UFC’s most notorious medical marijuana smokers, came to Healy’s defense. Diaz was all good until he decided to throw in the homophobic F-word. “I feel bad for pat Healy that they took a innocent mans money and I think the guy who took the money is the biggest Fag in the world.. #sorryasslittlebitch,” Diaz posted. Bryan Caraway was subsequently awarded Healy’s $65,000 Submission of the Night bonus. He’s the F-word Diaz is referring to. The UFC simply kept the $65K Healy was owed for Fight of the Night. The UFC quickly distances itself from Diaz after catching wind of his comment by indefinitely suspending him pending an investigation. UFC president Dana White, who used the insensitive term once in public and has regretted it ever since, initially claimed Diaz’s employment status could be on the line. “He will be cut or fined for that tweet. [Expletive] ridiculous,” White wrote on the Underground Forum. Diaz was just TKO’d by Josh Thomson on April 20, so it’s highly likely he would not have returned to action within the next three months, anyway. FYI, Diaz’s disclosed salary was $15,000 to show against Thomson.